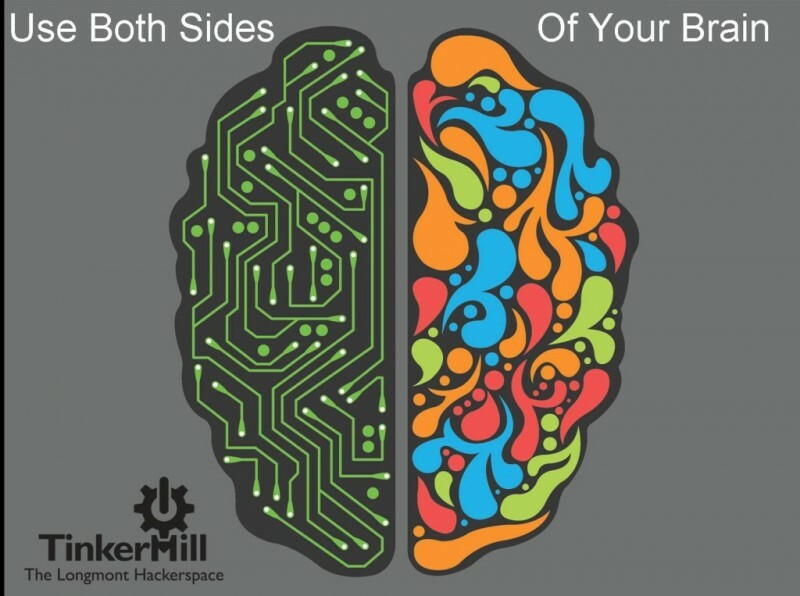 TinkerMill is a Hacker/Makerspace from Longmont, CO. Where like-minded people get together and collaborate on anything art, technology, science, and business related. Scott Converse is the founder of TinkerMill and tells us about the organization. What’s your meeting space like? Our workshop is over 6,500 square feet and we also have an office space. What tools do you have in your space? Are there any tools your group really wants or needs? Any PCB and pick/play stuff. Also some electronics supplies would be nice. Does your group work with embedded tech like Arduino, Raspberry Pi, embedded security, or MCU-based designs? We work with Arduino and Raspberry Pi a lot. Embedded stuff comes along quite often. For example we also work with Nvidia’s Jetson TK1 board, oDroid boards, and Parallella boards. What are some of the projects your group has been working on? We just did the Denver Mini Maker Faire. We also built a Tesla coil and we have about a dozen of other projects, which you can all find on our website. What’s the craziest project your group or group members have completed? For our craziest project so far I must say it was the 15 foot human-powered Ferris wheel. This was a great project! What would you like to say to fellow hackers out there? Come on down and BUILD something with us! Want to know more about TinkerMill? Make sure to check out their website! 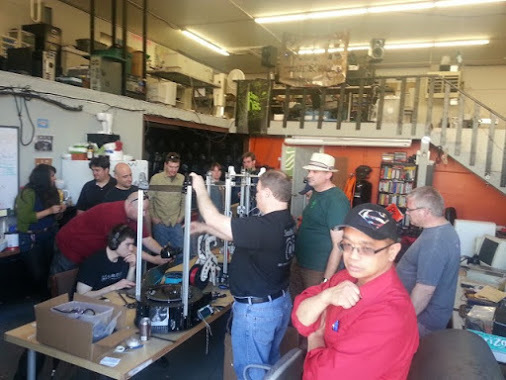 Show us your hackerspace! Tell us about your group! Where does your group design, hack, create, program, debug, and innovate? Do you work in a 20′ × 20′ space in an old warehouse? Do you share a small space in a university lab? Do you meet at a local coffee shop or bar? What sort of electronics projects do you work on? 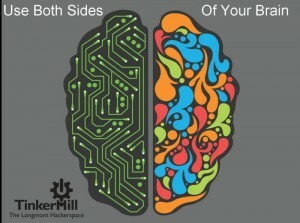 Submit your hackerspace and we might feature you on our website! Denhac is a hackerspace on a mission to create and sustain a local, community driven, shared space, that enables education, experimentation, and collaboration, by applying the spirit of DIY to science, technology, engineering, and art. It’s about 2,500 sq. ft. of commercial/warehouse/workshop space. We have an open shop floor area, bay doors, a classroom, an air-conditioned server room, and floorspace for several workstations specializing in various DIY areas. Textile workstation (sewing machines and USB driven embroidery machine) used for costuming, cosplay creation, etc. Electronics workstation with oscilloscopes, breadboards, components, testing equipment, etc. A metal forge, welding gear, carpentry gear, and CNC Tools. Yes, we teach classes on all of these (and more). Many and few, lots of individual projects. The group focuses more on collecting great tools for it’s members, and teaching classes on a broad range of topics (from making costumes, to hacking Arduino’s, to synthetic biology DNA hacking with bioblocks). 9′ Tesla coil. Also, a Steampunk flamethrower. You mentioned a Low Power FM group earlier, can you tell us more about it? Are there other events or initiatives you’d like to talk about? Yes, we’re just starting up a Low Power FM (LPFM) group that will be applying for a license to set up and run an FM community radio station at Denhac. We started a weekly Kids Coding Dojo class that teaches kids from ages six to fifteen how to code. (Accompanied by their parents.) We have a software defined radio hacking group (Radio Heads) that uses programs like GNUradio with SDR-capable radio kits and dongles to ‘listen in’ on the world. A BIG antenna is needed for that! We have a LockSport group that meets monthly and has some expert lock pickers. 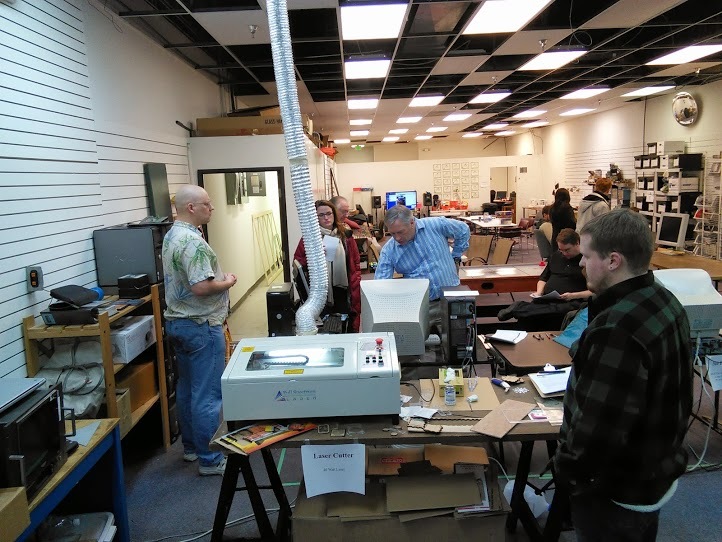 We have a 3D and LaserCutter printer group that meets as needed to teach members and the public how to use the equipment and to trade ideas on what to make next. Come and visit! We love visitors. Want to know more about Denhac? Make sure to check out their website! Show us your hackerspace! Tell us about your group! Where does your group design, hack, create, program, debug, and innovate? Do you work in a 20′ × 20′ space in an old warehouse? Do you share a small space in a university lab? Do you meet a local coffee shop or bar? What sort of electronics projects do you work on? Submit your hackerspace and we might feature you on our website!